**New for 2018/2019** – Winter programming options! Check out our Winter Program Guide to see the new winter programming options offered at Camp Kintail. Camp Kintail has many opportunities for year-end school trips, leadership trips, environmental education trips and more. We always try to make your school trip better than you expect and the highlight of the year for the students! We are located 15 minutes north of Goderich on Lake Huron. At the beginning of the 2015 season built an adventure tower that expanded the high ropes course. The adventure tower gives us 5 new partnered activities and a flying squirrel for a total of 13 high ropes elements and 6 rock wall climbing routes and a zip line. Each of these activities are operated with dedicated staff who have received special training from a licensed instructor and all safety equipment exceeds OPHEA requirements. It is intended to be challenging and exciting, and to help groups to communicate and work together, and challenge themselves. Individuals will be challenged and will try things they couldn’t anywhere else, which will lead to new self-discovery and confidence. The high ropes activities do take extra time and recommended for grades 4 and up. We have also updated our arts and crafts area in Harmony House, made improvements to the dining hall & purchased some new archery and orienteering equipment. We can accommodate trips that last the school day and extended day trips that run into the evening. However long you decide to stay, you choose the program options that interest you and your class. 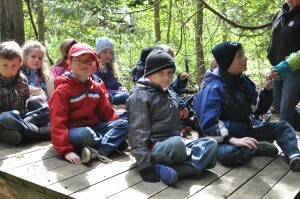 Always popular is our wide array of outdoor education sessions that can match with where you are in the curriculum. We have established, popular outdoor education sessions based on beach ecosystems or on the natural environment and habitats found around the campsite for each grade. We also have many other sessions that match with various parts of the curriculum, so if you let us know where you are in a topic, we can recommend the best session. A good example is a trip that recently came for outdoor education was studying fossils, so we could customize both a nature session and arts and craft session to match up with this. Our most requested school activities include our rock climbing tower, our low and high ropes & challenge course that has a variety of individual and group challenge initiatives that promote teamwork and communication, archery, and our 18 hole disc golf course. Some groups like to add canoeing and kayaking or beach exploring on our beautiful, wide sandy beach, while others enjoy sports like soccer, ultimate frisbee or ga-ga ball. Year over year the most asked for and repeated program is a classic game of capture the flag on the playing field and in the cedar forest. We highly recommend ending your stay with singing around the campfire and roasting marshmallows! We are happy to discuss your needs and wants, and we customize each program to suit your requirements and the number of students coming. You are always welcome to come and have a tour of the site, meet the staff, and see the program options.